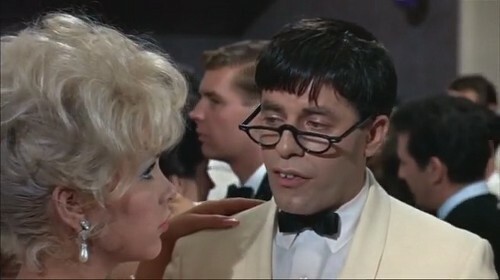 If you see just one Jerry Lewis movie, this should probably be the one; fans claim it’s his masterpiece, and though it’s overlong and not especially funny, it is fascinating and well-made. Lewis is Julius Kelp, a socially inept chemistry professor who whips up a formula to make himself more attractive and self-assured. The result is Buddy Love, a callous, egotistical womanizer. Some critics at the time read Buddy as Lewis’ dig at former partner Dean Martin, but later writers have persuasively argued that Buddy is the real Jerry Lewis — the greasy-kid-stuff Vegas Jerry we used to see beseeching us belligerently every Labor Day. Lewis has perhaps never been as impressive (or as self-revealing) a performer as he is here; he was extremely courageous to make himself look so bad as both Julius and Buddy. For a keen analysis of the film and how it fits into the context of Lewis’ life, check out Shawn Levy’s excellent 1996 bio King of Comedy.